b) help people convert online by using targeted copy that relates to their query. We’ve put together the basic considerations for getting started with Keyword Discovery to help put you on the right path to determining the words core to your business and marketing strategy. Determine your target audience by thinking about your ideal customer, or groups of customers. Many companies have a main target audience and secondary target audiences that have a different set of perceptions, hesitations and motivations driving their online decisions. Because of this, your audiences will likely have a different set of words and conversion behaviour that will need to be considered. Having clearly defined your target audience (or audiences), start brainstorming the words they would use when searching for you. Make lists for different themes or topics so you can expand on these as you get further into the discovery. Consider synonyms for keywords that mean the same thing, possible pain points for customers, problem solving words, and words competitors might use on their sites. Our choice of various Keyword Research tools differs depending on the type of customer and what data is available in their target markets. These are our general ‘go to’ tools for Keyword Discovery that help us determine target keywords that can be used in a digital marketing strategy. An old trusty, the Google AdWords Keyword Planner is a tool that has been around for years to help marketers determine the search volume and competitiveness of keywords. Primarily used for AdWords, the Keyword Planner contains CPC volumes and must be linked to an AdWords account. It’s easy to use – set your target geographic and enter some root words and it will bring up suggestions, average search volumes and search competitiveness on a scale of 0 to 1. Google Trends is another tool that can provide great keyword data concerning seasonal, mobile and rising search trends for your chosen topic. SEMRush is a useful tool that can be linked to your Google Search Console and Analytics account in order to display keyword search volume data with your actual performance in search engine results. This makes for useful analysis in finding areas of opportunity as the data can be filtered, for example to find keywords where you have a page in lower ranking (eg. position between 10 – 20), there’s high search volume and medium competitiveness). Google itself serves as a great Keyword Research tool. Just scan the Google results page of your brainstormed keywords and see what comes up. First check the suggestions Google provides as you type to see if there’s anything relevant, and also the suggestions at the bottom of the results page. Not only do these provide you keyword ideas, but also ideas for content development in the future. 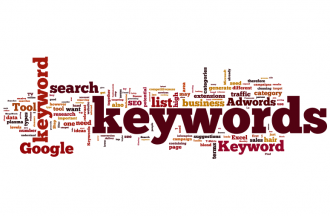 To use your keyword list in an effective strategy read out article Using Keyword Research to Maximum Effect. If you’re designing a new website or updating to a new CMS, we can help. Read more about our web design & development services , or get in touch with us today.